Jaltest is a multibrand diagnosis system for wich we have received the exclusive ditribution for Belgium by manufacturer Cojali. When you team up with Sanders Parts for diagnoses, you are not left out in the cold. We run the complete after-sale service ourselves and we organize training and demos at regular intervals. 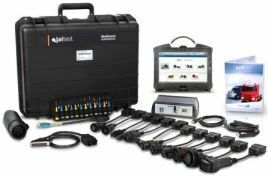 This diagnostic system can be offered tailor-made to suit our customer and has several different applications. Please feel free to apply for more information by sending us your request.